Ever want to take a squad of drones in your army, but just couldn't bring yourself to field a bunch of BS2 targets that your opponent will work really hard to ignore? Yeah, me too. I mean there are times when I want to put out a pack of marker drones to reduce my need for pathfinders --who my opponent WILL destroy. After all, pathfinders are kinda stationary (at least if you want them to be useful with their BS3 makerlights you had better leave them stationary or put them on a tidewall). Drones are jetpack infantry which makes them relentless which means they can move and then fire heavy weapons at their full BS. And they can move a some more in the assault phase. What's not to love? BS2, that's what not to love. BS2 is way worse than BS3 than it seems. BS2 is one-in-three, BS3 is 50-50. WAY worse. But there is a new formation that bumps that up a little. In the Mont'ka book there is a formation called "Drone-Net VX1-0" for Farsight Enclaves Armies. It requires at least four units of drones, and gives them jink, interceptor, outflank, precision shots, and split fire and +1 BS to ALL drones on the table as long as at least 2 drone squads from this formation are actually alive and on the table. You can field this formation for as low as 224 points. The +1 BS is really cool if you already include lots of drones in your army without drone controllers. The huge bonus, to me, is Interceptor. Suddenly, you have the option of BS3 markerlights during the Intercept phase. In the past, Tau could spam EWO to take out things like the Skyhammer, but then the Raven Guard got tons of cover against our EWO attacks. Now, a single marker drone squad can put enough markers on an enemy unit to strip all cover OR boost accuracy like crazy. This is a really good formation for filling out your list, since it can give you marker support All The Time and isn't too expensive. On top of that, all the other drones in your army just got those buffs as well. I'm telling you, this formation is one of those silent but deadlies. Drones just just got the shizzle. I don't think remoras get the boost as they don't have the Drone rule. But I love this formation too. I forgot that I was going to comment to say the same thing. This came up a while ago when discussing whether Remora and Sentry turrets were scoring. As best as I can make out, rules that apply to "Drones" only apply to models with the "Drone" type. You can find it in the profile section of both IA and the codex. Usually it is "Jet Pack Infantry (Drone)" but the Sensor Tower in IA is "Battlefield Debris (Drone Tower)" but in the profile section it is just Bd(dr) so it isn't certain whether it would benefit. 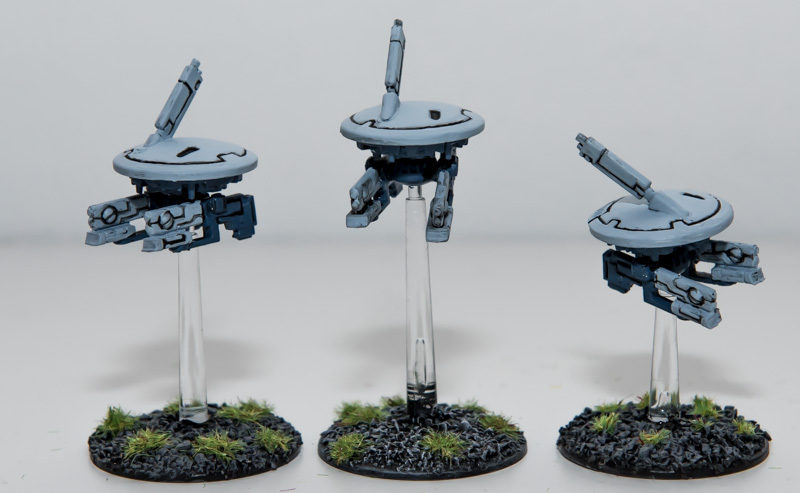 Remora and Sentry turrets don't have "Drone" in their unit type so they don't benefit. But they are scoring. What is a good balance in terms of number and type of drone? I'm building a split army list at 1,000 points, 1,500 points, and 2,000 points. The army is geared towards hoard killing as I expect to run into nids and irks in my area. I've never seen any min/max suggestions in that regard as to which blend of what drones and how many of each to take. Crisis suits, broadsides, riptide, multiple fire warrior squads and stealth suits. The +1 BS applies to all drones, which technically includes your opponent's drones too. Go figure. Warzone Damocles: Mont'ka. New Formations!